On September 12,2010 we enjoyed to climbing at Mont Charvin 2409 m.
I planned to repeat it one time agin On Sunday, October 16 before arriving the snow. Via Chalet De L’Aulp De Fier D’En Haut, after cossing a rocky bar and some pastures we arrive at Lac Du Charvin. From here we walk on the East ridge to the summit. Down to the Col De Porthets and via the West side, we arrive on the same trail where we have came. 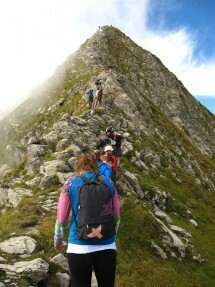 The route up from the lake, through the vertiginous ridge. This ridge is well secured with cable and chain. Gradient gain 1250 m. Length 15 km. For very experimented and sporty hikers, who don’t have vertigo. We meet at Gaillard, behind the customs of Moellesullaz, in front of the Librairie de France at 7:30. Inscription is obligatory. Equipment: Good mountain shoes, warm and waterproof clothes, glove, hat, helmet, drink, picnic …. All must be prepared the day before. There is a participation fee of 5 Euro for a license of the French hiking federation FFRP, including insurance. Gas-sharing charges for those not driving of 0.10 euro-centimes per kilometer. and deliver it to the organizer on Sunday morning.